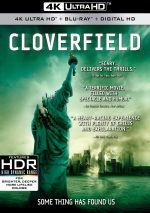 Eight years after Cloverfield offered a successful monster movie, 10 Cloverfield Lane delivered a sequel � sort of. Or not. After she fights with her boyfriend, Michelle (Mary Elizabeth Winstead) flees her New Orleans apartment and drives through rural Louisiana. As she ponders her relationship, another vehicle slams into Michelle�s car, and this knocks her unconscious. When she awakes, Michelle finds herself imprisoned in a small cement room. Michelle soon meets her captor: Walter (John Goodman), a man who claims he saved her from a threat that makes the outside world deadly. Another inhabitant named Emmett (John Gallagher Jr.) confirms some of Howard�s apocalyptic claims, but Michelle�s doubt remains. We follow Michelle�s attempts to separate fact from fiction and deal with her imprisonment. Earlier I claimed that Lane provides a semi-sequel to Cloverfield, but don�t take that too far. One can find connections between the two, but these links remain awfully tenuous � so tenuous, in fact, that even after I read comments from the filmmakers, it�s still unclear where Lane exists in the prior movie�s universe. All I do know is that Lane offers a radical shift from Cloverfield. Whereas the 2008 movie delivered a wild, frantic monster movie, Lane gives us a quiet, composed thriller that hints at the Hitchcock sensibility. Actually, to a certain degree, Lane feels like the Tim Robbins basement scene in 2005�s War of the Worlds stretched to feature length. That might sound like an insult, but I don�t mean it as one. Lane takes a particular premise and spreads it out to create an interesting drama in its own right. Much of the tension relates to Walter�s sanity � or potential lack thereof. Lane leaves many elements up for interpretation, so it plants clues but doesn�t telegraph notions that would spell out concepts for the viewer. I appreciate that fact. Most movies tell us everything without room for nuance, whereas Lane leaves open plenty of room for different views and debate, and most come back to Walter, as he stays a slippery character. I�ve now seen Lane three times, and I still find it hard to nail down the details behind Walter. Did he actively stalk Michelle? Did he really have a daughter? Did he want Michelle to be a surrogate child or a spouse � or neither? Good questions, ones that I can�t clearly answer � and maybe no one else can, either. Lane provides hints but leaves enough wiggle room for discussion and various views, a refreshing change from most Hollywood fare. Our limited group of actors do well � especially Goodman. He gets the most challenging part, as he needs to give Walter a creepy edge but not go too far into nutbag territory. Goodman succeeds in this endeavor, as he adds just the right vibe to the part. All that, and the end of the world, too! Maybe � I don�t want to spill too many beans about what happens here. Suffice it to say that 10 Cloverfield Lane keeps us guessing and becomes a lively, involving thriller. 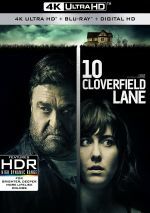 10 Cloverfield Lane appears in an aspect ratio of approximately 2.36:1 on this 4K UHD Disc. This became a solid presentation. Sharpness was largely positive. A smidgen of softness crept in during a few shots, but the majority of the film delivered accurate delineation. I saw no jagged edges or shimmering, and edge haloes remained absent. Print flaws also failed to play a factor here, so the film looked clean. In terms of palette, Lane tended toward standard teal and orange. These hues showed nice representation within stylistic constraints. Blacks were deep and dense, and shadows seemed well-rendered, with mostly smooth low-light elements. While not a visual showcase, the image worked nicely for the material. Despite the story�s restricted setting, the Dolby Atmos soundtrack of Lane worked nicely. Downconverted to Dolby TrueHD 7.1, the movie came with occasional instances of dynamic information, mainly during a few action sequences. Those popped to life in an exciting fashion. Most of the flick went with gentler audio, and those segments succeeded as well. These contributed a good sense of atmosphere and formed a creepy, claustrophobic sensibility throughout the film. Despite its mostly subdued nature, the soundscape helped bolster the story. Audio quality seemed solid. Music was bold and full, and effects followed suit, as those elements appeared accurate and dynamic. Speech remained natural and without edginess or concerns. I felt the soundtrack suited the tale and helped it succeed. How did the 4K UHD compare to the original Blu-ray? Audio was identical, as both discs sported the same Dolby Atmos soundtracks. As for visuals, they showed a moderate boost, as the 4K looked sharper than the Blu-ray. It also boasted more dynamic colors, deeper blacks and smoother shadows. While the 4K didn�t blow away the Blu-ray, it clearly offered the superior presentation. Though no extras appear on the 4K disc itself, the included Blu-ray copy brings us some materials, and we locate an audio commentary with director Dan Trachtenberg and executive producer JJ Abrams. Both sit together for this running, screen-specific look at story/characters, Trachtenberg�s experiences as a first-time director, cinematography and editing, cast and performances, sets and production design, music, audio, effects and other domains. Trachtenberg and Abrams provide a perfectly serviceable commentary. Though they occasionally spend too much time on praise, most of the track sticks with movie-related information. The piece moves fairly well and gives us a good � if not great � look at the film. The disc also contains seven featurettes. With a total running time of 34 minutes, 42 seconds, we find �Cloverfield Too� (9:07), �Bunker Mentality� (3:48), �Duck and Cover� (1:44), �Spin-Off� (3:52), �Kelvin Optical� (6:07), �Fine Tuned� (6:42) and �End of Story� (3:19). Across these, we hear from Trachtenberg, Abrams, producer Lindsey Weber, co-producer Jon Cohen, production designer Ramsey Avery, director of photography Jeff Cutter, costume designer Meagan Luster, special effects supervisor Matt Kutcher, Sr., special effects technician Matt Kutcher, Jr., editor Stefan Grube, VFX supervisor Luke McDonald, supervising sound editor Robby Stambler, composer Bear McCreary, co-producer/unit production manager Bbob Dohrmann, and actors Mary Elizabeth Winstead, John Gallagher, Jr., and John Goodman. The featurettes cover the project�s origins and development, story and characters, the director�s approach to the material, cast and performances, set design, costumes and cinematography, various effects, editing, audio and music. These go over a good array of topics and do so in a manner that accentuates the commentary. Taut and compelling, 10 Cloverfield Lane offers a brisk thriller. It boasts a clever twist on its genre and strong performances to turn into a fine experience. The 4K UHD brings us veru good picture and audio along with some informative supplements. Lane delivers an exciting tale that the 4K reproduces well.